Each artist has their own personality. Their music is a reflection of their history, experiences, and vision of life. Simrit has positioned herself as an international icon of sacred music and is one of the most anticipated artists at Sat Nam Fest Mexico. Her great passion and devotion for music reflects her spiritual path, creating memorable experiences for everyone who listens. Simrit has fascinated Mexican and international audiences with her unique style. The magic of her music, her voice, and the great band of artists that accompany her on stage take us on a journey to deep places of the heart and soul in an environment of introspection, joy, and gratitude. This week, we had the opportunity to interview her. Enjoy what she has to say about her next visit to Mexico! Sat Nam Fest: What do you love about Mexico? What I love about Mexico is the culture. I love the people. They are so warm-hearted and kind. I love the language, and I love the food. Sat Nam Fest: What is your favorite part of Sat Nam Fest México? My favorite part of Sat Nam Fest Mexico is the amazing feeling I get when seeing everyone, hearing all the music, and taking classes. I love the family atmosphere that the festival creates. It’s such an amazing heartfelt and cozy feeling, and there is always a major heart opening and transformation that happens. Sat Nam Fest: What´s new for your performance this year? What’s new about my performance for this year is that I’ll be playing some new songs, as well as older favorites, and I’ve grown since last year. So, every time I play music, it’s different, as I am always evolving as a person. I may be playing with some special guests as well. Stay tuned. Sat Nam Fest: Can you give us any insights about the class you´ll teach with Jai Dev? For the class Jai Dev and will teach together, expect an incredible transformation and an experience that will stay with you. 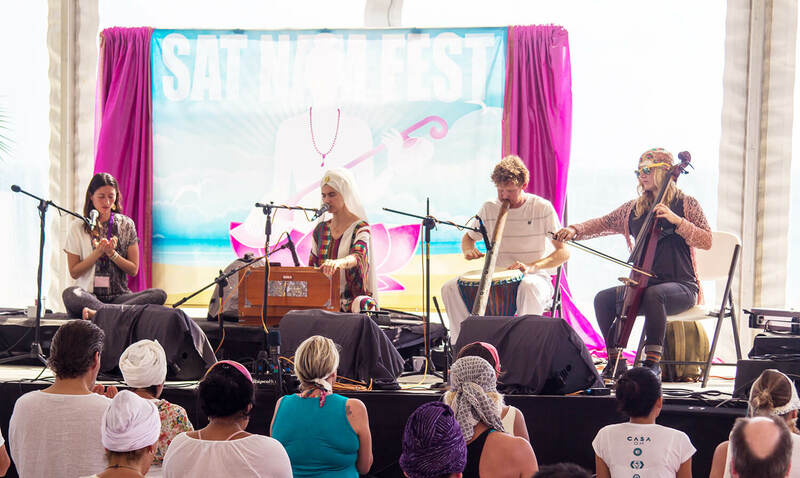 You can expect powerful and penetrating live music and teachings intertwined together in the unique synergy of both Jai Dev and me together. Sat Nam Fest: You are a great inspiration for so many women. What’s your secret to being such an amazing mother, artist, teacher, and wife? Thank you so much! I don’t have any secrets. 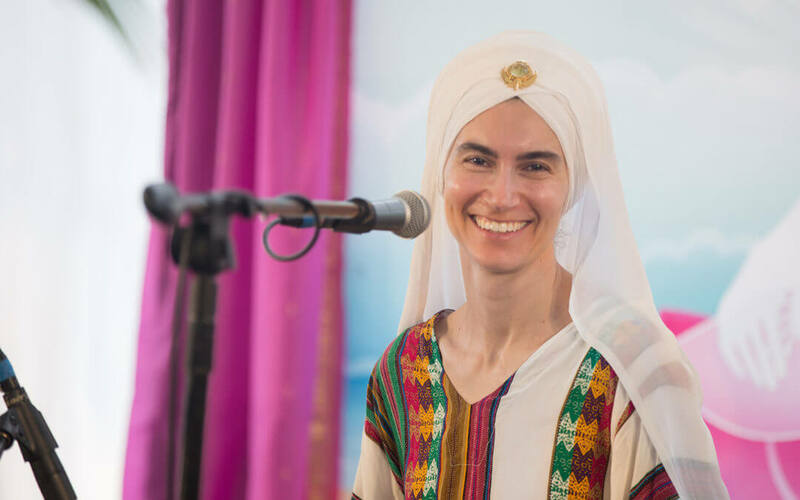 I simply take care of myself by eating well, drinking lots of water, taking very good herbal and vitamin supplements, doing my Kundalini Yoga practice, exercising, and practicing and playing music. These things help me to feel really healthy and strong. I chant a lot, whether in the car or washing dishes. I usually keep a mantra going in my head or I’m repeating it aloud. This helps me a lot in life as I am a very empathic person. Also, I think the main thing that keeps my mind healthy is flexibility and staying away from fanaticism. I give myself permission to relax and live, and enjoy things in life, and I aways keep the word “moderation” in mind. I think the main thing that I’ve been given from my mother and father that has helped me as a person is the notion that I have everything I need inside of me, and that no one knows me better than me, and that simply being myself makes me worthy. So, I don’t seek approval from anyone. I only seek it from myself. This helps me be authentic and helps me to be really unique, stylistically, as well. I stay away from trends, and the only person that I’m trying to impress with my music and art is myself. My parents always taught me that my greatest power is my unique, authentic way of life, and I also grew up with a very unique brother with special needs. So, I feel fortunate to have had these experiences with parents who continue to support and encourage me as a human being, an artist, a mother, a wife, a teacher, etc. They were my first teachers and still are, and I love them deeply, and we are very close. My mother is a very strong woman who was and still is very confident in herself and her unique and elegant style. I am close with my parents, and I feel that they are a source of strength that I will always be able to draw upon. These are the things that I pass along to my son, that his unique and authentic way is the most prosperous way for him. He is, indeed, a very unique soul who is a natural leader, who is very comfortable in his own skin. I love that about him. So, I have no secrets, just life experience.